If you are looking to open your own business and have experience in masonry work, you may wish to consider a masonry repairs business. Construction companies are popular among entrepreneurs . They often require minimal investment and can be run by working from home. There are a number of things one should consider, however. This post is designed to educate you on the top four things you should know before starting a masonry repairs business. You probably already have masonry experience. However, you need a contractor license before you can start a masonry repairs business. Contractor license fees depend on your state of residence and business operation. Application fees and annual fees generally apply. The average cost is about $500 for the first time, with $200 renewal fees every year or two. You may also have to pass a test on trade and labor laws to be licensed, as is the case with the Manchester Chamber of Commerce. If you already have several years of experience on the job, this test might be waived. Check with your state labor department to find out your specific requirements. The first thing to know before starting a masonry repairs business is that you must get your contractor license. You will need to invest anywhere from $2,000 to $10,000 in tools before starting your masonry repairs business. Make sure you buy quality tools that will withstand repeated use, even if it means you have to finance your business at first. The tools you use at home for an occasional job will not survive the abuse of a business. You will also need to invest in a truck if you do not already own one. Make sure it is large enough to transport your tools and your employees. Consider buying used to save some money. A brand new truck will get beat up by the tools you are transporting. This is another reason you may want to consider buying used. 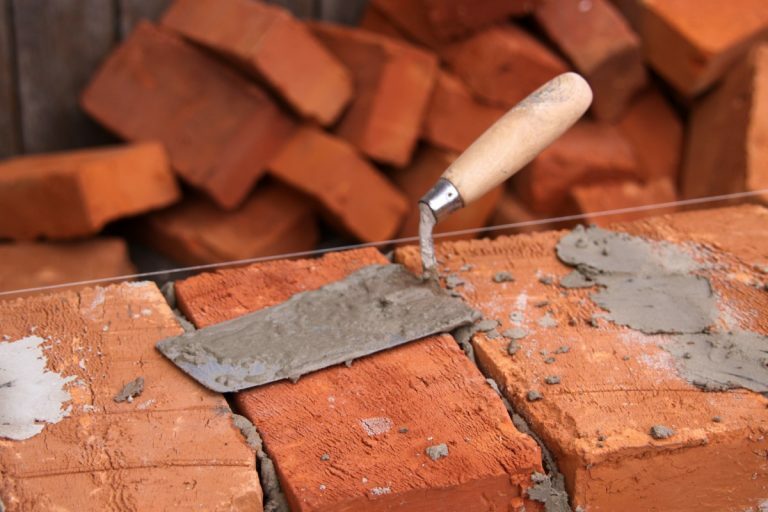 When starting a masonry repairs business, make sure you buy the right tools. You will instantly gain legitimacy once your masonry repairs business is insured and bonded. Businesses that skip this step open themselves up to dangerous consequences should an accident happen on the job. Your insurance will protect you in case you are injured. You need liability insurance of at least $500,000. Bonding will protect your clients and the state. It ensures the job you are hired for is done satisfactorily and without loss or damage to the client’s property. Seek bonding of at least $500,000, just like your insurance. Depending on your credit rating, your bonding premium can be anywhere from 1% – 5% of the amount. This rate can reach up to 15% for those who have poor credit. Make sure you protect your business and your clients. Have your masonry repairs business bonded and insured. You must invest in technology to support your masonry repairs business. Build a website with a portfolio of some of your work. If you can afford it, pay for search engine optimization so customers searching for masonry repairs will find you first. Make sure your contact information is easily displayed on your website. Your team should have smartphones and tablet devices during client visits. Customers expect to be able to see examples of your work. Using these devices is much more professional than carrying around a photo album. You should also use technology to schedule appointments. Send customers email reminders and communicate via text message when appropriate. Finally, use technology to use social media marketing for your business and digital ads by following social media tips. When you start your masonry repairs business, be prepared to use technology every day. Your masonry repairs business will not have to worry about competing with large, nation-wide companies for business. That makes it easier and cheaper to get customers using local advertisements. Taking out ads in local newspapers and cable networks is cheaper than other marketing processes, and thanks to the lack of big-name competition, just as effective. Use local advertising to get your business name out there and just wait for the calls to roll in. You are sure to gain customers, and if you do good work, you are sure to have repeat customers and word of mouth advertising. Keep this in mind to help your masonry business succeed. A masonry repairs business can be relatively easy to start if you have the right experience. At least four years of experience working with brick, stone and concrete is to be expected. Make sure you get a contractor license before you do anything else. Buy the right tools for your business, including those for credit card processing. Keep in mind that these tools will need to survive multiple jobs. Get insured and bonded. This is for yours and your clients’ safety, as well as piece of mind. Finally, be sure to use technology to market your business and be efficient. Remember this post if you are considering opening a masonry repairs business.